This tiny guide to Brussels begins with a double-page spread of the top ten attractions, with a colour photograph and brief caption for each one. Included are the Grand-Place, Manneken-Pis and the Atonium, but Bruges, Ghent and Antwerp also feature here, so the attractions are not restricted to those of the capital of Belgium, Brussels. The book has a six-page introduction followed by a chapter on the history of Brussels. After this comes the main section of the guide, entitled ‘Where to Go’, which has subsections for the different areas of the city. Also covered at the end of the section are excursions to Antwerp, Bruges and Ghent. The next chapter, ‘What to Do’, includes information on shopping, entertainment, festivals, sports and Brussels for children. The last three sections of the guide are dedicated to ‘Eating Out’, ‘Handy Travel Tips’ and ‘Hotels and Restaurants’. As expected, there is an index at the end. Dotted throughout the book are various short texts known as ‘Features'; these cover a variety of subjects from the Battle of Waterloo to the Lace Society or a Calendar of Events. It is very easy to find information in this guide, thanks partly to the colour-coded strips at the top of each page, every chapter having a different colour. The ‘Where to Go’ section is almost thirty pages long, but the name of each attraction is printed in bold so it stands out clearly. Added to this, the twenty-one most recommended sites are signalled by an arrow in the margin where their name appears. These top sites include museums, a park and the cathedral as well as the Grand-Place and Mannekin Pis. The chapter on ‘Eating Out’ gives information on when to eat in addition to the specialities that Belgian restaurants offer, including drinks as well as main dishes, vegetables, seafood and snacks. A few phrases linked to ordering food and understanding the menu are given in French as well as Dutch. Restaurants are listed further on in the chapter ‘Hotels and Restaurants’, which uses between one and four Euro signs to give an indication of price. The section entitled ‘Handy Travel Tips’ covers a wide variety of subjects. While there may not be a great deal of detail, website addresses are given for, to give one or two examples, bicycle hire, gay and lesbian travellers, and bus services. This chapter includes a number of panels that give useful phrases in both French and Dutch, but the text is printed in white on a pale blue background which does not make for particularly easy reading. Fold-out maps in colour are provided inside the front and back covers for Belgium as a whole as well as Bruges, Brussels and Ghent. The beauty of this guide is that it is light in weight and small enough to fit into a large pocket or handbag. Although it is such a small format, it still has its fair share of colour photographs throughout. One disadvantage is of course that the font used for the text is quite small. 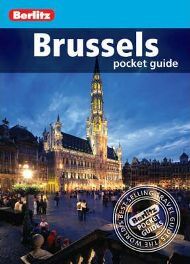 The guide should be ideal for a short trip to Brussels where travellers need a small, light book to carry around. For an extended stay in Belgium’s capital, or for those wanting more detail, larger and more comprehensive guide books are available. No Comments on "Brussels Berlitz Pocket Guide"